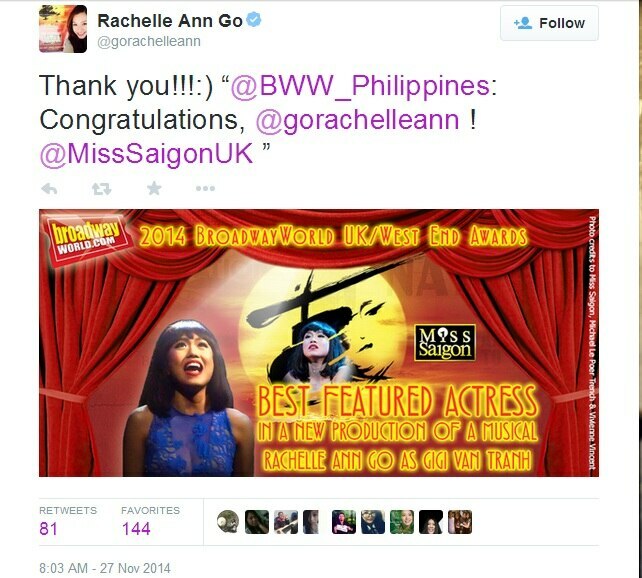 A grateful Rachelle Ann Go took to her Twitter account, to thank those who voted for her to get her first West End award. 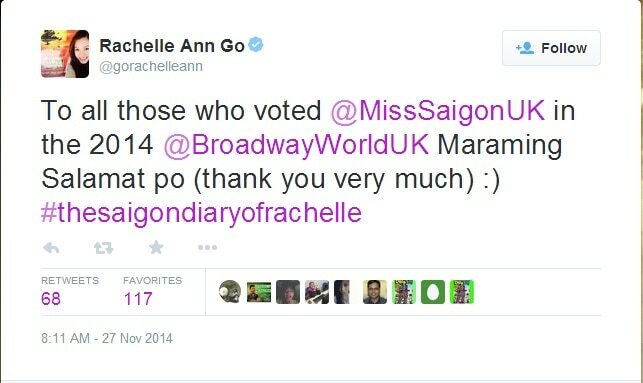 Rachelle is playing the role of the lead bar girl Gigi in the current revival of Miss Saigon in London. The said role earned her the Best Featured Actress in a Musical in the 2014 BroadwayWorld UK Awards. The winners was announced on the award-giving body’s website last Friday. Apart from Rachelle, other Filipino thespians on the show Eva Noblezada and Jon Jon Briones were also recognized by Broadway World. Filipino-American performer Eva Noblezada, who is playing the role of Kim, took home the Best Leading Actress in a New Production of a Musical recognition while Jon Jon, who plays the role of The Engineer, earned the nod as the Best Leading Actor in a New Production of a Musical. Out of the 25 awards, 11 were picked up by Miss Saigon.